If you are a long time reader of my blog, you may remember that I had an ant problem in my kitchen a year ago (read about it here). Well, Terro helped me out and eliminated all of my ants. Guess what? They never came back! Terro contacted me to ask if I have Moth problems and would like to review their newest product. I do not have moth issues at all, but I am sure that some of my readers do. So I asked them if I could host a giveaway. 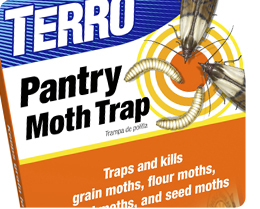 The Terro Pantry Moth Traps are easy to use and they are non-toxic. Each package includes "two glue traps and two individually wrapped pheromone lures. Use one lure for each trap by gently pressing the lure into the center of the trap and place the trap in areas where moths have been spotted. For best results, replace the traps every three months or if the trap becomes dusty or full of moths". Tell me if you have tried to do anything to get rid of your moths (if you don't have moths and want to enter to protect your house from future pests, that is okay too. Just tell me what you would do if you got them). Giveaway ends 03/24/11 at 9pm EST. Giveaway is for US residents only. No P.O. Boxes. Winner will be chosen randomly. Winner will be contacted via e-mail and then will have 48 hours to respond before a new winner will be chosen. Disclaimer: I was not compensated in any way for this post, I am doing this completely for my readers to help them try a great new product. The thoughts here are my own honest opinions. We've always had issues w/Moths getting into our birdseed. What we usually do is simply store the seed in the freezer. A couple years back however, little moths bascially invaded our home, and we had to have pest control help us get rid of them. Such a hassel! I put all my dry goods in jars and put them in the freezer-I can't seem to get rid of the moths! I have moths but I don't know what to do to get rid of them. I tossed a couple of mothballs up in the attic. I can still smell them though. I LIKE TERRO on FB~ Jennifer L.
Somehow, we acquired a serious moth problem about two years ago (from buying bulk grains at a health food store - we think) and we have tried everything to get rid of these destructive little critters. Most products don't work at all and pretty much all of them SMELL terribly and are an embarrassment as well. At this point I'll try anything - Terro sounds promsing and I'd love to give it a try! Posted on Terro's FB Wall thanking you both for the giveaway. I cannot seem to get rid of moths, I have to put food in the freezer and still they remain. Would love to try.